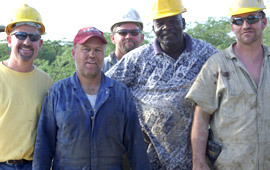 The drilling crew from Clear Blue Water Project. (L to R: Bruce from Ohio; Kelly from Idaho; Jason from Oregon; Snaider from Haiti; and Arron from Oregon. Arron Swenson '92 is the pastor of Cornerstone Community Church in Pendleton, Oregon. He was in Haiti when the earthquake struck on Tuesday, January 12, 2010. On the board of the Clear Blue Water Project, Swenson was leading a five-man crew drilling a well when the quake struck. The day had been uneventful for Arron Swenson — known as Pastor Mud when he’s drilling in Haiti. He and the tall, noisy drill were, as usual, surrounded by onlookers. That well, being dug about 10 miles from Port-au-Prince, would soon, the crew hoped, provide water to several hundred local residents. Then just before 5 p.m., the ground began shaking, and the bystanders scattered. “They, like me, thought I was doing the shaking,” says Swenson, who had just reached 115 feet. Soon he and his team were scrambling to keep the rig from falling and breaking as the earthquake continued. “Out on this very flat terrain, it looked like 4-foot waves rolling on the ocean,” he remembers. Once the team knew the drill was safe, they headed for the city. “I had a sinking feeling inside, knowing that it would be bad if it shook as hard in town as it had by the drill,” he says. In what became a two-hour drive to Port-au-Prince, the crew saw the roads jammed and bodies along the streets. Now dark, another large tremor struck, and the drilling team heard cries of terror from earthquake survivors. When the team finally arrived back at the Free Methodist Guest House where they had been staying, they discovered the building had collapsed — and several missionaries were buried in the rubble. Swenson and the drilling team quickly donned hard hats, coveralls, and gloves. After two hours of digging, they found and freed Katie Zook, daughter of Greg Zook '83 and Dawn Flohr Zook '81. It took them another two hours to free Jack Munos, a Free Methodist missionary. Munos’ wife, Rev. Jeanne Acheson-Munos, was killed in the earthquake. View these images taken in the days before and after the earthquake, courtesy of Arron Swenson and the Clear Blue Water Project. Read about other SPU alumni who were in Haiti at the time of the earthquake.